No axe needed. LOGOSOL's smart log splitter is an easier and ergonomic way to do get the job done with logs and kindling. Wood gets split by raising and lowering the striking weight instead of swinging an axe, so there’s less strain on your back. The weight delivers up to 30,000 pounds of force and hits the same spot, every time. I’m giving this 5 stars although I’ve not used it yet and will update when I do. But I did open it up and was impressed with the qualityuality and workmanship that went into making it. thing doesn’t look durable enough. 2days and a cord of wood later- he said, “WOW”! Gadget! Tine and energy saver magic!! LOGOSOL has created an easier to use ergonomic alternative to an axe, which is fitting coming from a team that has dedicated the last 20 years to making more efficient and user-friendly woodworking tools. This Sweden-based group is headed up by Bengt-Olov Byström, who grew up splitting logs on a farm. 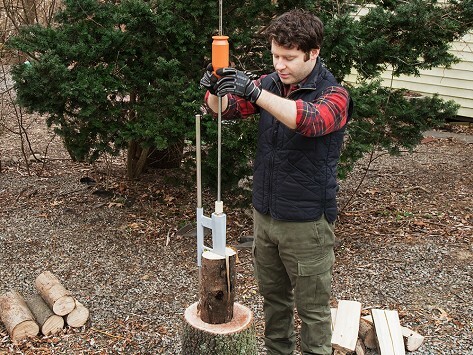 Their smart log splitter proves that just about anyone can split a log—but probably not the way you think. Instead of swinging an axe, you’re lifting and dropping a 7.8 pound striking weight to split logs and kindling. This means less strain on your back and better accuracy. Once it’s set up, it will hit the same spot every time—and with more force than you can probably deliver on your own (up to 30,000 pounds). We tried it out and found this splitter to do the job faster—so we had more time to curl up by the fire.